Carpetsure specialize in carpet cleaning for rental properties. We always strive to offer an open and honest service. Below are some of the benefits of using Carpetsure. Trading Standards Approved - Guaranteeing you ethical and honest service. 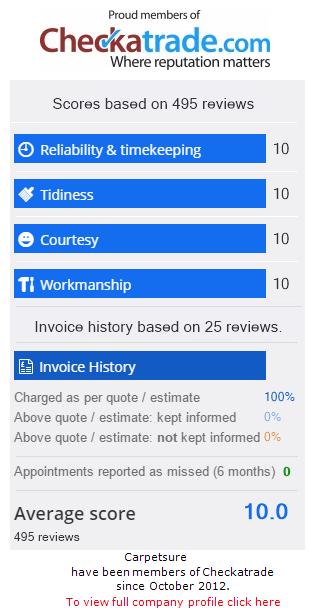 Proud members of Checkatrade - our reputation really does matter to us. High Powered Truck Mounted System - We are one of a few companies in our area to use this level of equipment. Full satisfaction guaranteed - we offer a personal service and pride ourselves on our attention to detail and customer care. Fully trained professionals - we have under gone extensive industry training to insure you are getting the best service. Eco friendly solutions - that are safe for you, your children and pets. The fastest possible drying times of your carpets & fabrics – so you can use them as soon as possible. Free friendly advice - whether it is stain removal or keeping your carpets and upholstery in tip top condition.